I hear it all the time. When an athlete gets to the professional level, they feel an increased sense of entitlement. It’s like they expect everyone surrounding them to do everything for them. They want people to make restaurant and hotel reservations for them. They expect certain prestigious treatment wherever they go. On and on it goes. The cycle often starts a long time before the pro level. A sense of entitlement involves lots of ego and unfulfilled expectations. Expecting others to bend the rules for you since you are so very talented. Feeling “put out” when people request favors from you, but not having a problem asking for huge favors from others – after all, you deserve it. Expecting others to be more intently engaged in your conversations than you are in theirs. How can we ward off this entitlement attitude at the high school level before it becomes a cancer of what psychologists call “learned helplessness”? There are a few actions a parent or coach can take to burst the bubble of entitlement and bring the student-athlete back down to earth before it becomes a major problem. Teach student-athletes to work hard for their needs and wants. If an athlete wants new equipment or supplies, require him to pay the first half, either from a part-time job or from a creative endeavor such as a product or service he can sell to others. You pay the second half. Sure, their time is limited and their focus should be on their academic studies. But athletes need to adjust to living in a busy world. Many pro athletes started their businesses during the regular season. Roger Staubach, retired quarterback for the Dallas Cowboys, is one such example, as is Dhani Jones, retired tackle for the Cincinnati Bengals. Real life dictates that we earn the things we want. Require a contribution for what you provide as a parent. The typical family structure says, “We all contribute to the good of the household.” Just because you have an athlete in your family doesn’t mean everyone else gives and the athlete takes. Every member of a family enjoys clean clothes, food on the table, and clean dishes – that means everyone must contribute to the smooth running of the household. The student-athlete, as well as other members of a family structure, need to understand their unique responsibility to give back to their family, their neighbors and their community. Teach and demonstrate how good it feels to celebrate the success of others. A byproduct of social psychology research is an area called capitalization research. Capitalization research shows that promoting and celebrating other people’s successes yields a positive effect for the sharer. Encourage your student-athlete to choose a different person each day and promote and celebrate that person’s endeavors and successes. It may become a habit of the best kind. Express gratitude. On the shoulders of celebrating other’s successes comes developing the art of expressing gratitude. Intentional gratitude handwrites that thank you note to someone who gives you a gift. Intentional gratitude makes a phone call to a family member, friend or acquaintance who performs a special task for you. Practice “perspective taking.” Use this exercise as a teachable moment with your student-athlete to help him understand situations from the other person’s perspective. Ask your student-athlete to recall a recent event that slightly annoyed him. Then, provide a paper and pen (no computer) and have him spend three minutes writing about the scenario from the other person’s perspective. The more your student-athlete practices looking at things from the viewpoints of others, the less he will feel entitled. Being confident in one’s ability and talent is one thing; it’s healthy. Possessing a sense of entitlement and thinking the world owes you is an unhealthy mental practice and needs to be nipped in the bud as soon as it rears its ugly head. 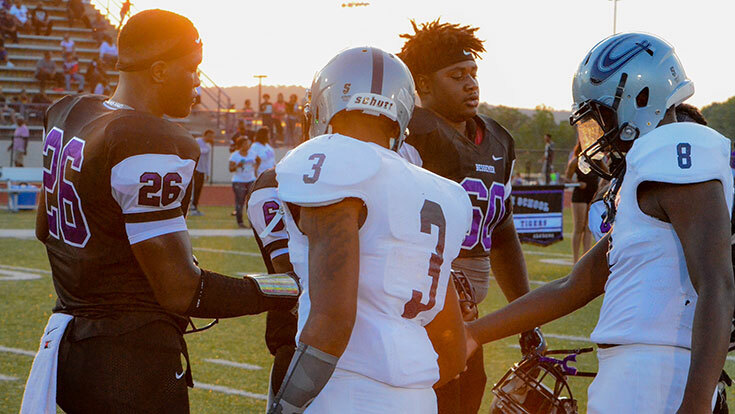 Enlisting these five tips will get your student-athlete moving in the right direction of a balanced, giving mentality instead of living a life of entitlement, which really equates to selfishness. Michelle Hill, the Strong Copy QB at Winning Proof, helps athletes tell their stories by ghostwriting books. She works exclusively with pro athletes, coaches, team owners, and other sports professionals by helping them move their book idea from the red zone to the end zone.